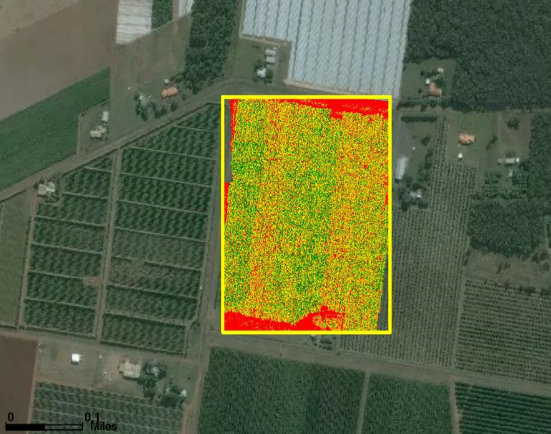 Mr Bob Hibbard, Head of Faculty Science at Bundaberg Christian College shared with us an NDVI (Normalised Difference Vegetation Index) image taken from a drone they purchased through the AGSIP Small Grant scheme. The drone is equipped with a normal RGB camera and an infra-red camera. The data from these are combined to produce the NDVI data. This shows the photosynthetic activity of plants. The drone was taken on a field excursion by their Senior Agricultural Science class at a macadamia farm in the Bundaberg region. The survey image is of 12.5 ha. The farm has been planted in blocks of three varieties. The farmer had commented that one of the varieties did not yield as well as the others at harvest. When the NDVI image was displayed, the variety not producing well was clearly shown (in yellow and orange as opposed to the healthy green). Also showing clearly are bands across the rows indicating where irrigation drippers drain out. Students were able to use this information in their assignments regarding recommendations for the farmer. The image was also provided to the farmer for his use. The same technology has also been used on the Senior Biology field study of coastal ecosystems.